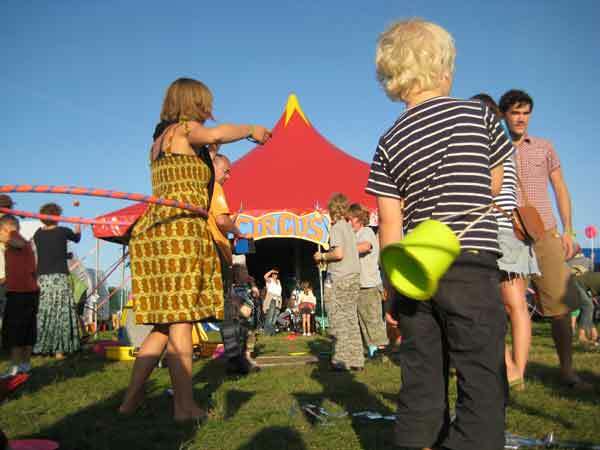 I can provide circus workshops for almost any age and occasion, they can be on a drop in basis to play, learn and have fun at all kinds of events such as garden parties, fetes, weddings, barmitzvas, public fun days and festivals or more formal and structured for schools, brownies, guides, scouts and the corporate world. Circus and juggling workshops have an amazing and diverse range of benefits; it helps with numeracy and confidence especially in children, Hand-eye co-ordination and peripheral vision is substantially enhanced, Camaraderie and team work benefits and general fitness is improved- not to mention that it’s jolly good FUN!! 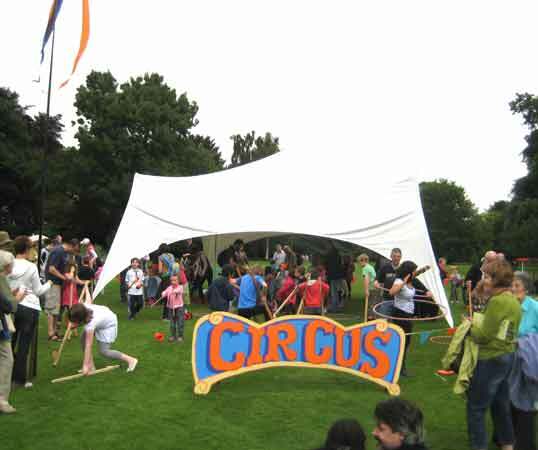 Circus workshops for team building can be in a number of formats, free play style or by structured instruction through a number of different skills, a free play section can be added at the end. A very popular style is learning individual skills as a group, depending on numbers and budget this can be with 1, 2 or more instructors and a round robin style, toward the end of the session each group can then present their new skills to the rest of the participants in the form of a skills demonstration or short fun show. 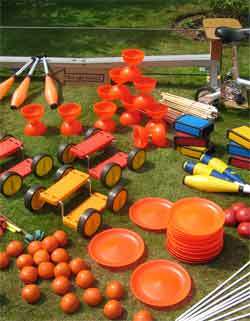 It is a great way to encourage team support with an added fun competitive element. In addition to this a prize can be provided for the winning team. 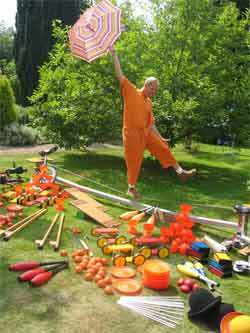 I have over 20 years experience of teaching AND performing circus skills, this makes my workshops a fabulous mixture of coaching and performance enabling me to skilfully demonstrate all the different circus workshop props used within each session. 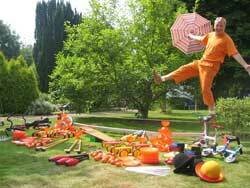 Skills and props used are Juggling with scarves, beanbags, balls, rings and clubs, Diabolo, Devil sticks, Cigar boxes, Spinning plates, Yo Yo, Balance, Rolla bolla, Stilt walking, Hula hoops for children or adults, Unicycle, Tight wire walking and Mini micro clown bike. I also work on a regular basis with several other performers and can assemble a large team if required for circus workshops with particularly large numbers of people or specific requirements. All my equipment is of professional quality and in top condition, colour coordinated in orange and red and carried in coordinated boxes. 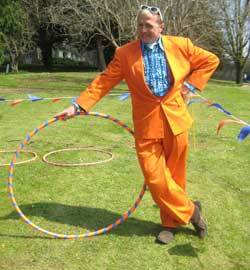 For outside events I can create an enclosed area with wooden or plastic stakes to support orange/blue bunting. New for this year are six 5 metre festival flags again in orange and blue. The scene is set with my 8 foot 'Circus' sign and a pair of sign written notice boards to advertise 'Circus Workshop' with space for times and other information and if desired a compact music system and appropriate background music. I carry full liability insurance, enhanced CRB certification and DBS clearance. I am based in the village of Alfrick Pound, Worcestershire and I am on the Worcestershire Preferred Providers List for child safety & protection.